Probably more-so than most broadcast shows, Agents of S.H.I.E.L.D. has always engineered itself to retool in the second half of a given season, especially now that Agent Carter seasons halve their momentum. We left Coulson in 2015 with interplanetary excursions seemingly behind us (though the cold open throws that in a new direction), and a zombified Ward poised to menace the team anew, alongside Gideon Malick. 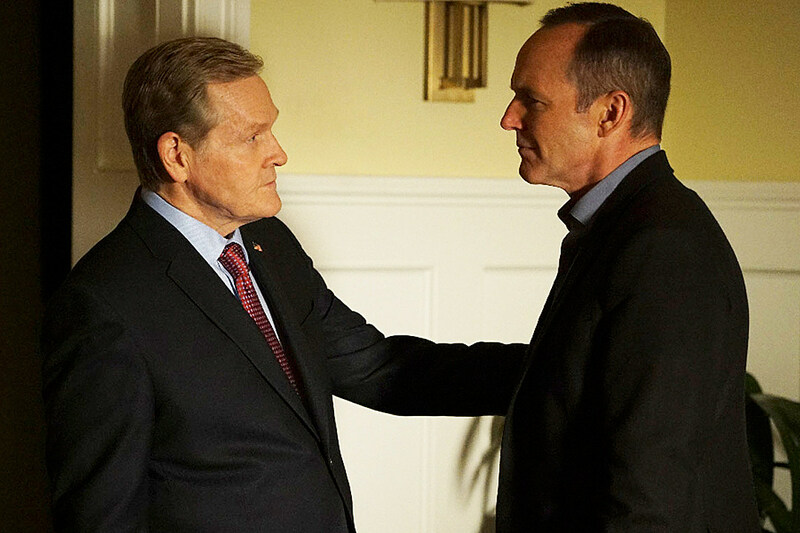 It doesn’t appear as if very much time has passed when “Bouncing Back” picks up, that Coulson can still meet with President Ellis (William Sadler) in Rosalind’s blood-stained apartment, though tonight’s premiere very much resets the table in giving Coulson shadow control of the ATCU, and pivoting toward worldwide Inhuman* panic. Of course, Ellis can’t publicly recognize the rebirth of S.H.I.E.L.D. for the movies’ sake, but Agents’ has done reasonably well to live in both worlds. Now, more than ever, we’re “Bouncing Back” into a world rife with superpowers as well. *Not terribly unexpected, but poor timing that this week saw Captain America: Civil War’s writers acknowledging that they had no concept of S.H.I.E.L.D.’s plan for its Inhumans, that it garners no mention on the film’s worldwide stage. It’s still a great conflict for the series itself, and it’s intriguing that Sadler’s President Ellis is almost gaining on Nick Fury’s intermedium go-between. "They even let me keep the Iron Patriot suit! Too bad you don't have the budget." 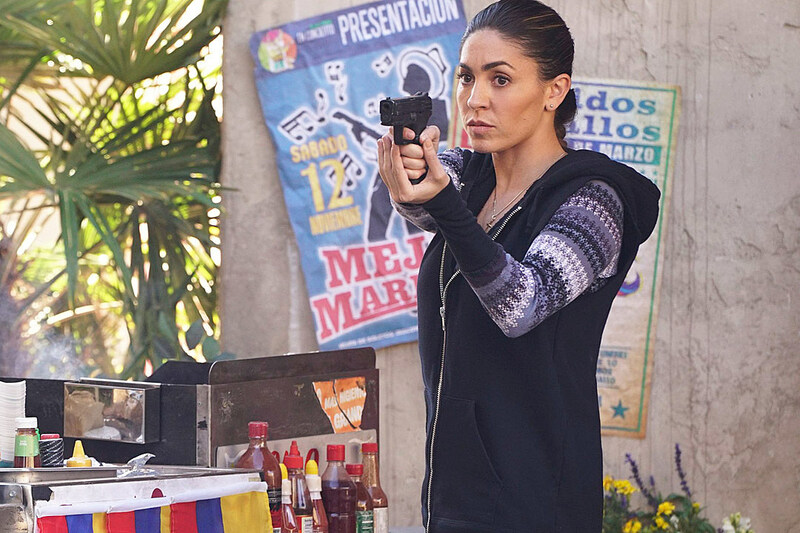 That mentality becomes a bit more regular with the introduction of Natalie Cordova-Buckley’s Elena “Yo-Yo” Rodriguez, herself imbued with distinct personality, powers and a strong bond with Mack from the start. It’s a tremendous bit of fun to see her semi-speedster powers in action as well, particularly combined with Skye’s at the police station for the proto-Secret Warriors action we’re all craving. That said, Agents still hasn’t found the means with which to keep super-powered additions around longer than a few episodes, instead clinging to the human cast we started the series with. No one would suggest bumping off Simmons or May exactly, but it’s tough for Agents to tease us with characters it ultimately can’t commit to, that Yo-Yo opts to stay home, and merely keep in touch with the team. Ward of course marks the biggest representative of that mentality, a character long-since elapsed in usefulness to the story, the nu-Hydra adventures of which proved the biggest drain on Season 3’s first half. If we’re stuck with the character as a new alien entity of sorts, Brett Dalton does imbue the figure with a certain creepiness in the early-going, moreso than his sickly grey makeup alone. We don’t yet have the greatest sense of its plans or personality beyond stock contempt for humanity, but returning the great Powers Boothe as Gideon Malick more than hold up that end, pushing Coulson darker than we’ve ever seen before. In that respect, placing Werner into the T.A.H.I.T.I. machine was a means to an end, but it’s worth noting even May sees the time on “Maveth” as a “Cavalry” event or sorts for the S.H.I.E.L.D. boss. Season 3 had a lot of fun finding places for every team member in a given mission last year, and that certainly continued tonight, to have Bobbi and Hunter* snarking about the unfairness of Inhuman powers, while “Bouncing Back” also made time for a reboot of sorts for Fitz and Simmons’ relationship. The hour even opened on a nice mystery of sorts (seriously, is every show doing this lately?) to wonder what’s up with that future exploding Quinjet with the crucifix** necklace. May sat on the sidelines, while Skye’s role was mostly moving the investigation forward, and Lincoln … was also in there somewhere, I suppose. *Remind me why Agents of S.H.I.E.L.D. is giving away two of its best, wittiest characters? **The presumption is that the crucifix necklace belongs to Yo-Yo, that we see her wearing it back in the present, though given a hint of chemistry with Mack, I’d be more worried he’s the one floating in orbit. WILL NO ONE TAKE UP THE MANTLE OF SHOTGUN-AXE? Agents of S.H.I.E.L.D. has only trended upward, despite what ratings might suggest, and It doesn’t feel as if “Bouncing Back” is about to start losing step. I expect the “Secret Warriors” momentum could prove a bit difficult to sustain budget-wise, but there was great superpowered action on display tonight, while the premise of recruiting and investigating new characters lends better to intermediary episodes than last year. Coulson’s got near of the entire ATCU at his disposal now, and even the Ward of it all has only up to go from the season’s first half. We more or less have to be done with the character after Season 3 anyway, so hopefully the dark streak we’ve seen this season won’t pull back in the end. Joey’s still not a redshirt yet! Always appreciated. If something feels familiar about Mack waking up tied to a sink, it’s because he did exactly that to Hunter last season. Guessing that Lincoln’s theory about Inhuman powers will come back into play this season? Nice as it was to have Gemma acknowledging Fitz’s efforts this season, boy, does that relationship need to pick a direction. I will forget every single week that Lincoln is a doctor. Putting the emphasis on Mack and contrasting views on Inhuman beliefs as divine gifts was a nice touch. If you’re wondering about the Absorbing Man, Marvel since clarified their mistake that the character will appear next week, not tonight. Agents of S.H.I.E.L.D. will return on March 15 with “The Inside Man,” airing at 9:00 P.M. on ABC.